Renata Adler is one of the most original, incisive and witty writers active in American letters today. Whether it be fiction, reportage or essay, her work is marked by a truly extraordinary intellect and a luminous prose that is penetrating, precise, deft and, often, very funny. In this new collection-which includes the early and definitive profile of the National Guard; the widely discussed and still controversial review of Pauline Kael; and the first major piece about foreign contributions to American political campaigns-Adler's wide-ranging reflections become focused on two increasingly fused interests: the politics which govern our public world and the media, which now actively distort and misrepresent information about that world. 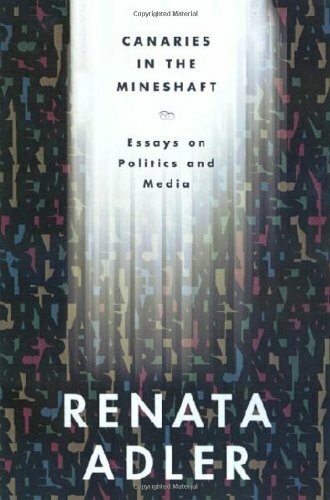 For anyone seriously interested in politics and the media Canaries in the Mineshaft is yet another proof that Renata Adler is one of the most delightful and brilliant writers of our day. Renata Adler is the author of two novels, Speedboat and Pitch Dark, and four books of nonfiction: A Year in the Dark, Toward a Radical Middle, Reckless Disregard and Gone: The Last Days of the New Yorker.